For a mission that was almost never to be, STS-125 will be remembered in years to come as a resounding success story, one of NASA’s great missions and a tribute to the ingenuity of engineers and astronauts alike. 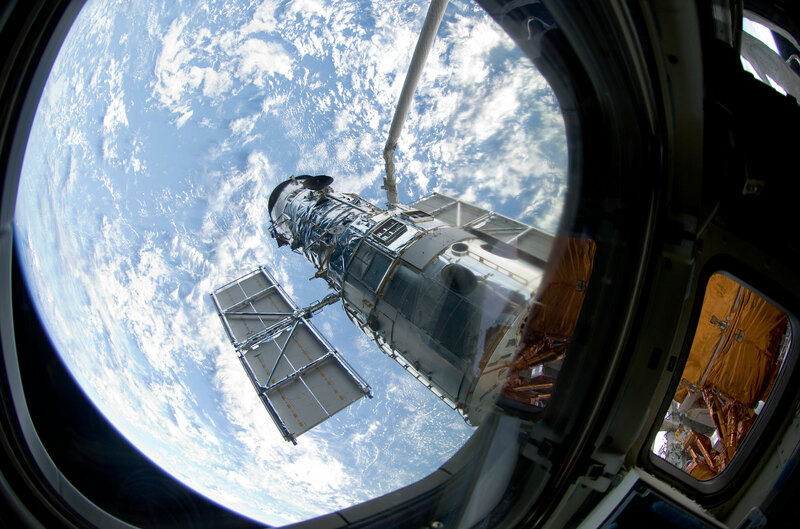 Rejuvenating the world’s most famous telescope and setting it free to make more scientific discoveries the mission of STS-125 marked the final visit to the world’s most famous telescope Hubble, and it took place in full view of the world’s media. I was fortunate to be at Kennedy Space Centre’s, KSC press site for the duration of the flight, as a fellow of the British Interplanetary Society, reporting on behalf of the society I was honoured to be there. In the past I have been fortunate to meet NASA Administrator Charles Bolden as well as Bruce McCandless, who were both members of the STS-31 team that launched Hubble into space in 1990, and I have met and lectured alongside Dr Jeffrey Hoffman who was mission specialist on STS-61 the first repair mission to Hubble in 1993, so I felt a close affinity with the mission of STS-125, I was so happy to be at the Kennedy Space Centre to witness it. 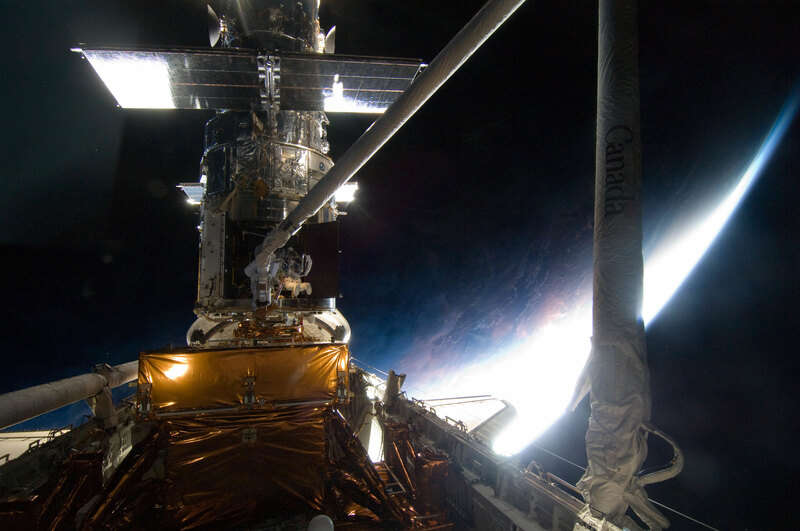 It seems such a long time ago now, way back on the 16th of January 2004, when the then NASA Administrator Sean O’Keefe originally cancelled the repair mission to Hubble, and by doing so, put paid to any future repair missions to the telescope as well. His reasons, citing safety constraints imposed by the Columbia Accident Investigation Board after the loss of Columbia on February 1, 2003. During the announcement, Sean O’Keefe stated that it was his decision alone as administrator, and not a recommendation from any other departments. At the time, the decision was widely criticised by both the media and the scientific community and even some from within NASA. Hubble it seemed was to remain an injured bird with no hope of rescue. At the time of Sean O’Keefe’s decision, one senator in particular from Maryland, Barbara Mikulski who was actually a member of the Senate subcommittee that oversees NASA’s budget, came out and openly accused him of making a decision outside the transparency process against the wishes of the science community. She was so annoyed that she actually stated she would work to reverse the decision that he had made. In March of 2004, another representative, Mark Udall went one step further and actually introduced a bill to the House of Representatives that requested an independent panel of experts review Sean O’Keefe’s decision to cancel the servicing mission in the first place. Amazingly, at this time, someone else was joining Barbara Mikulski as an advocate for servicing Hubble; he was none other than NASA’s Chief Scientist, John Grunsfeld who was to become one of the five STS-125 mission specialists. John Grunsfeld had also been present at that meeting when Sean O’Keefe announced the cancellation of all future Hubble repair missions. Grunsfeld had by that time, visited the telescope in orbit twice. Though he was disappointed, Grunsfeld continued to spend time working on possible scenarios for the robotic repair missions to Hubble that had been suggested and other in-orbit repairs that did not include using humans. The National Academy of Sciences had also looked at robotic mission to service the telescope and had concluded that it was in no way a feasible option and in light of the scrutiny of the return to flight changes post Columbia they said a Hubble repair mission should be reassessed, that of course including humans. When Sean O’Keefe announced his resignation as NASA Administrator in December 2004, members for the senate, the media and science community and those within NASA saw hope for the telescope’s servicing mission to be reinstated. Now that Michael Griffin had been appointed Sean O’Keefe’s replacement, he literally took just two months to announce that he actually disagreed with Sean O’Keefe’s decision, and that he would now consider sending a shuttle again to repair Hubble, maybe because he had close links to the telescope himself, given he was as an engineer and he had previously worked on Hubble’s construction. He totally and utterly respected the discoveries the telescope brought to the science community and wider public audience as a whole. When STS-114 the return to flight mission post Columbia was deemed a success and was then was then followed by STS 121 all the lessons learned and improvements in flight mission management, the managers and engineers started to work on a plan that would see a return to Hubble that would still adhere to the Columbia enquiry requirements. On October 31, 2006, a major milestone was achieved, Michael Griffin finally announced that the Hubble servicing mission was reinstated and should be scheduled for 2008. He also announced the crew that would fly the mission, which included astronaut and physicist John Grunsfeld. Once the mission had been agreed it was then important to schedule the mission to fit in with the existing flight manifest. originally the STS-125 mission was assigned to space shuttle Discovery with a planned launch date sometime around May 2008 but delays to several space shuttle missions resulted in yet another change in mission ordering, and the orbiter assigned to STS-125 was eventually changed from Discovery to Atlantis. Following tropical storm Fay in August 2008, Atlantis was rolled from one of the three Orbiter Processing Facility (OPF) to the huge behemoth that is the famous Vehicle Assembly Building (VAB), where it was mated to the external fuel tank (ET) and the solid rocket boosters (SRBs) some issues were then encountered during the stacking process, and more terrible weather due to Hurricane Hanna caused yet another delay in the rollout of Atlantis to the launch pad. Even more delays followed when Lockheed Martin had problems with manufacturing delays on the External Tanks relating to enhancements imposed by the Columbia Accident Investigation Board which made it hard for them to produce two External Tanks, one required for Atlantis and another required for STS-400 Endeavour, the Hubble rescue mission. Once these issued had been worked out though, it looked likely that all was set for STS-125 and a return to the Hubble Space Telescope, but an issue on Hubble itself rather than on the ground this time put paid to that. On September 27, 2008 aboard Hubble, the Science Instrument Command and Data Handling (SIC&DH) Unit on the Hubble Space Telescope failed. 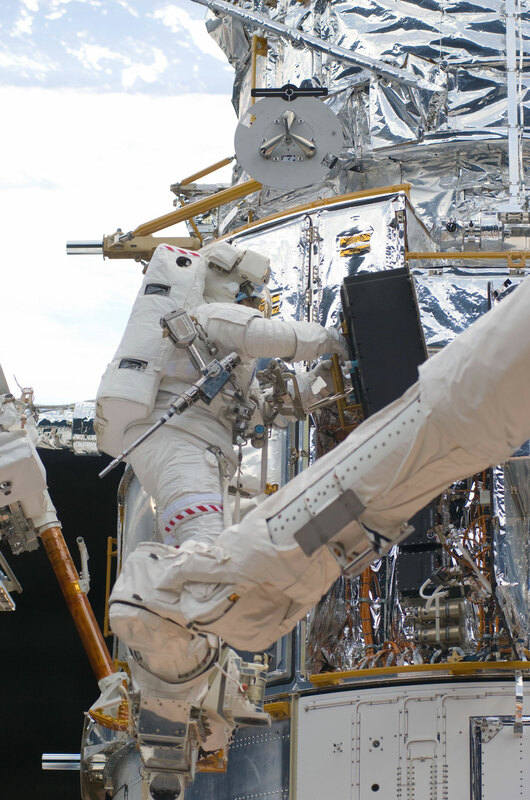 The unit is essential for Hubble as it keeps all science instrument systems aboard the telescope synchronized to process, format and temporarily store information on the data recorders or transmit science and engineering data to the ground. Without this working Hubble was unable to return data to the earth so mission planners decided yet again to delay the launch of STS-125. On October 30, 2008, NASA announced that they had decided to remove Atlantis from its SRBs and ET stack and send it back yet again to the OPF to await a new targeted launch time which was then slated to be at at 1:11 p.m. EDT on May 12, 2009. On April 24, 2009, NASA managers issued a request to move the STS-125 launch up one day to May 11 at 2:01 p.m. EDT, in order to give them an added day’s leeway before the range was passed to the the US Air Force for an exercise. The mission would mark the 157th American manned space flight, the 126th shuttle mission. It would also be the 30th flight of Space Shuttle Atlantis. It was an early start, up at 4am, quick breakfast and heading out to the KSC Press Accreditation Office in order to get my mission badge that would allow me access to the media site at KSC for launch. On opening I was told told I had to go to the other KSC badging station to get a “Greeny” ID badge them return to the Press Accreditation Office for our mission badge, it was a learning curve but great experience too. All done I would now have to wait to be “bussed” into the press site along with Rick Mulheirn. All foreign media since 9/11 have to be bussed into the site each time they want to attend. Happily I waited and the bus duly arrived. Up until this time I hadn’t allowed myself to get too exited at the prospect of launch. I know many friends who have been to KSC over the years to see launches that have been scrubbed or cancelled; indeed, I met a gentleman in the airport who said this would be his 6th attempt, only ever seeing it go once, so it was always in my mind that something could go wrong. The Space Shuttle is an incredible machine, but with so many complex flight systems and things that may go wrong, it seems you are in the lap of the gods but fortune was to smile on me this day. Before launch there are a number of things that have to be done, the evening before launch day the crew spend their last night at the crew quarters building near the KSC industrial area as they prepare for the following day’s events. The orbiter has undergone tests and fuelling as the countdown clock runs and then stops with its built in holds. By this time, I was at the press site taking it all in, asking a few questions and talking to people about various things and introducing myself to some of the NASA people. I then go outside and put or camera gear by the side of the NASA TV stand in prime location for launch. As I take a look around I notice that right by the side of me on NASA TV an interview is taking place. One one side is former astronaut Leroy Chiao (Ph.D.), in the middle conducting the interview is former CNN spaceflight correspondent Miles O’Brien and to my surprise on his right, non other than Sean O’Keefe, the very man who had cancelled Hubble’s repair mission back in 2004. Here he is commenting on and watching the final mission to Hubble, quite an irony I thought. I take a stroll and see retired astronaut Jim Newman a four-time shuttle flyer, who had visited Hubble as part of the STS-109 crew giving an interview. Lots of of power cables, cameras, TV monitors, gazebos, TV and radio and TV vans and a myriad of different nationalities all here to see Atlantis soar skyward. I try to take all this in and enjoy being in such a privileged and famed place. It was as we were told busier than normal. In the press room, we are told we will be allowed to go and see the crew “walkout” from their quarters, the busses are ready to take us there, but we have to leave all our gear on the floor beside the bus to begin with whilst the sniffer dogs make sure all is safe to go. Once at the crew building we get into position and after quite a wait we get to see the crew come out. You know of their impending arrival as just a few minutes before the suit techs in their distinctive Khaki overall’s come out first with the crew’s flight helmets in bags and then at the bottom of the elevator corridor a guy with what looked like an M16 rifle was spotted and soon after that you hear the distinctive sounds of the NASA “Huey” above your head as the crew make their way out to the awaiting press, other dignitaries and workers. The crew give a wave then pause for a picture opportunity in front of the amassed press core, and then begin their boarding of the astro bus that will transport them out to Pad 39A. Several people commented that they didn’t get too many good shots as the IMAX team had their camera in the way; a film is being made of the mission using IMAX so I look forward to seeing that sometime in the future. Fortunately for me though I was nowhere near it. It really was incredible to see the crew walking out; it’s like being transported to a special place you only ever see on television, in magazines or books and where other historical astronauts have taken the very same steps. The crew astro van is followed along by the NASA Huey and by an armoured vehicle , it looks very menacing and no doubt has enough armament inside it the size of a small country, but this is serious business and NASA rightly leave nothing to chance. 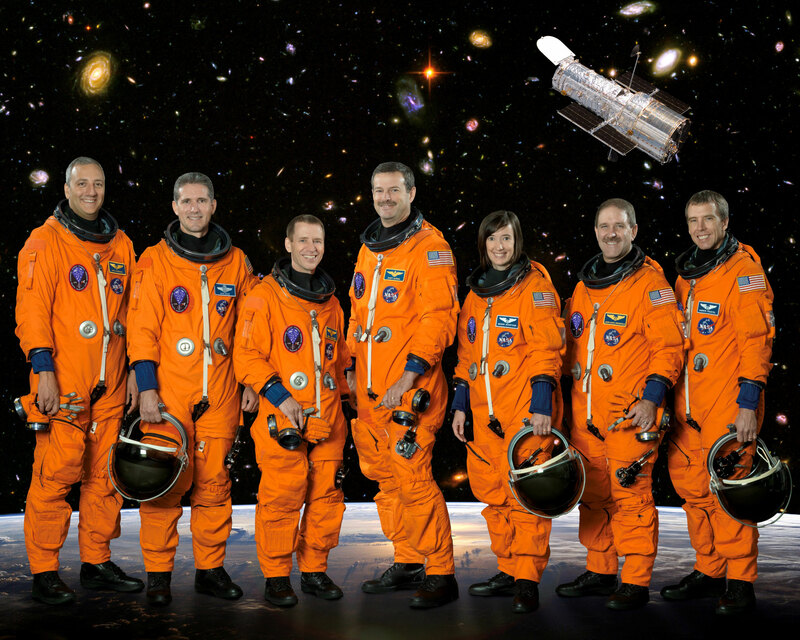 The crew of STS-125 is comprised seven astronauts, Commander Scott “Scooter” Altman for whom STS-125 would be his fourth spaceflight and his second visit to Hubble; Pilot Gregory Johnson making his first spaceflight; mission specialist Michael Good a first time flyer; Megan McArthur the flight engineer and lead robotics specialist, making her first space flight; John Grunsfeld, a NASA veteran, who would be making his fifth flight into space and his third visit to Hubble; Mike Massimino, making his second flight into space and second to Hubble; and finally Andrew Feustal another first time flyer. One thing that made the crew seem more tightly knit was the fact that they had been in training for this mission for years, each subsequent delay brought them closer together as a groups and in turn gave them more time to practice the tasks they would face in the coming days of the mission. Whilst en-route the crew passed the VAB in order to drop off Chief Astronaut Steve Lindsay so he could go out to the Shuttle Landing Facility (SLF) and fly weather recon. The prime crew then continued their trip out to Pad 39A and their entry into the vehicle ready for launch. As for me, it was back into the press bus and back to the press site to soak up more of the atmosphere prior to launch, not long to go now, just a few hours. I watched the crew ingress Atlantis on the monitors in the press room and then decided to take a walk to set up my camera. Many more people were doing the same thing, professional photographers were setting their gear up with remote triggers which they could just leave in-situ and not have to worry about it at launch once they and I were set. T minus 2 minutes, the anticipation starts to build, then were down to T- 30, 20 , 10 and I just stand in awe this is, after all my first launch..
Main engine ignition, booster ignition and at 2:01pm EDT Atlantis was on her way. I am struck by the sheer intensity of the brightness, truly amazing and then I am aware of the people whooping and waving as Atlantis rose into the clear sky. A few seconds later I felt it; the vibration of the air caused by the SRB’s as it pounded my chest and crackled in my ears, a sensation that will stay with me always, truly incredible. A Shuttle launch is not just a visual thing; it is a whole body experience. Go Atlantis! Later, I was informed that this had been a particularly noisy launch due to the higher than normal temperatures, so much so in fact that one of the light fittings in the press room had been dislodged from the ceiling. Outside I watched as Atlantis soared into the sky through some light cloud, I could still see the glow of the SRBs almost up to SRB separation. Atlantis was on her way to orbit. I meanwhile headed back to the press room and attended the post launch press conference. We found out that soon after launch and during the initial phase of the ascent it was reported that a problem was happening with a hydrogen tank transducer and a circuit breaker. Flight controllers alerted the crew immediately but advised them to disregard the associated alarms and continue their flight to orbit. After working through their post launch checklists, the crew opened the payload bay doors, deployed the microwave Ku Band antenna used for communicating via the Tracking and Data Relay Satellite TDRS. They then moved through their checklist into the robotic activities portion of the day including payload bay and crew cabin surveys. On the third day of the mission the crew performed the Hubble rendezvous operations that included burning the orbiter’s engines to refine the approach to the Hubble telescope. The crew had been having problems with communications and as a result it caused some delays in getting towards the telescope. The crew guided Atlantis to within fifty feet of the telescope and 20 minutes late Megan McArthur successfully grappled Hubble 340 miles above Western Australia. Just under an hour later the telescope was safely soft docked in the payload bay. Hubble was once again “captured”. Further along in the day 3 schedule, four of the crew, Grunsfeld and Feustel along with Michael Good and Mike Massimino set work on preparing for the next day’s EVA, they set about gathering the tools needed that had been developed by aerospace and defence company ATK and then they checked out the suits and equipment that would be used during the EVA. The crew was informed that the damage assessment team had cleared all of the orbiter’s TPS tiles and blankets, and that all looked safe which meant that the crew was no longer required to do a detailed tile inspection. Incidentally data actually showed there had been a wing impact event on launch as it had been on Columbia in 2003 but it was deemed to be well below the force that would indicate a flight issue. It was noted too that when a camera inspection of Atlantis’s cargo bay had been carried out it seemed that there was some sort of dust or debris around the box housing the Wide Field Camera (WFC-3). The crew took hi resolution images of the debris and it as deduced that it was not present at launch but most likely it was caused by something that vibrated and shook loose from the payload bay insulation blankets during launch 3 days prior. The crew were advised where at all possible to be careful when working around the WFC-3 container but that is wasn’t a major issue. On the fourth day of the flight the crew awoke to the song Stick Shifts and Safety belts by CAKE an American Indie band from Sacramento, California played for Andrew Feustal. Today was going to see the first EVA and it was John Grunsfeld and Andrew Feustal that were given the honour. Using a high resolution camera Feustel provided the team on the ground a visual inspection report on the material seen around the WFC-3 box, reporting to the ground team that “I don’t really see any of those particles” After getting their tools and equipment for the EVA in place and set they began to remove the old Wide Field Planetary Camera 2 (WFPC-2), which was way back in 1993 during the the STS-61 Mission, Grunsfeld and Feustel replaced it with the new camera but not without incident as Feustel initially had some problems removing one of the bolts from the old camera which needed more torque than they thought would be required. Feustel achieved the torque required with the aid of a torque limiter that fortunately had been thought of and stored back in the airlock. The great worry was that the bolt holding the WFPC-2 would sheer and break thus not allowing it to be removed, that would have been disastrous, but the ground team gave Feustel the go ahead to apply as much force as he thought it would take and to everyone’s relief in came out, job done! Once they had installed the new WFC-3, which will allow Hubble to see farther into space and across a wider spectrum of colours, they connected it up to power, teams at Goddard Space Flight Centre sent commands to the unit to see if it was “alive and awake”, fortunately it was, and that indicated that the EVA team had installed it correctly, task 1 had been completed. Back in September 2008 when the STS-125 mission was being prepared for launch, one of the computers on Hubble failed. This was the Science Instrument Command and Data Handling Unit, or SIC&DH that’s used to send data to Hubble’s instruments and then formats it ready for transmission to the ground. This was replaced and the final EVA task for day four got under way, installation of what is termed the Soft-Capture Mechanism (SCM). Good news on day 5, the ground crew informed the crew that the WFC-3 had passed all the overnight tests, indicating that it was in good working order, a great result for EVA 1. Now though it was the turn of Massimino and Good. 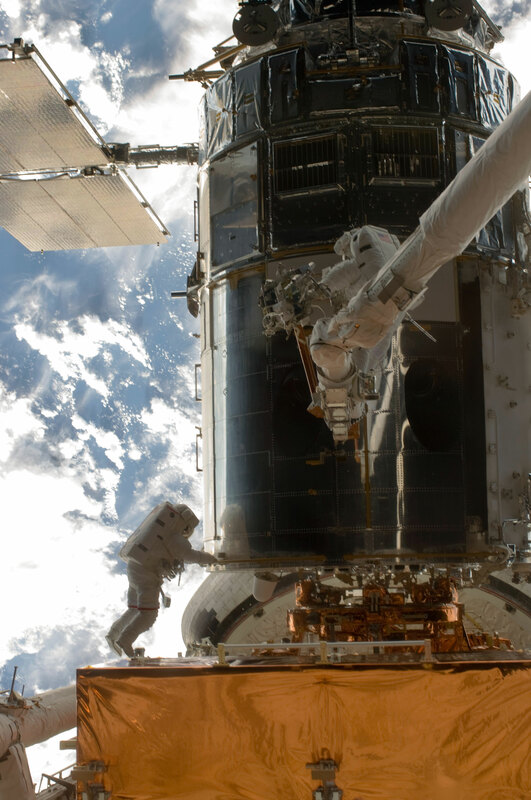 The first task for EVA 2 was the removal and replacing Hubble’s three gyroscope rate sensing units (RSU’s). Each unit contains two gyroscopes that allow the telescope to point itself. The first unit was replaced without any issues but when they attempted to replace the second unit, RSU 3, the unit would not align onto the guide pins, and they could not get it to sit correctly into the vacated bay, so ground managers had to come up with a solution. It was duly decided that the best way forward would be to put the RSU unit originally intended for the number one bay into the 3rd bay, fortunately that worked, but he problems were not over yet, after attempting to install the second unit into the third and last bay this one would not now seat correctly in place and in the end they gave up trying. It was then decided to use one unit that was carried as an additional fight spare. This one was originally removed during STS-103 and had been taken back to Earth and refurbished, not ideal but at least it worked. This was a critical series of installations tasks for the mission critical to Hubble’s survival in orbit. Three sets of gyros had already failed to work in the past so replacement was essential for the longevity of the telescope. Massimino and Good them moved on to the batteries and replaced them too, a good day all in all. Today the crew awoke to the sound of a song called Hotel Ceppolina by Fuzzbox Piranha played especially for Hubble veteran John Grunsfeld but once everyone was up it was down to the serious business of EVA number 3. Today’s tasks for John Grunsfeld and Andrew Feustel started with one that was deemed to be one of the most challenging of the mission and certainly one of the most uncertain in terms of it going to plan and working, but these task were considered to be very important, some of the most important of the entire STS-125 mission. The first job was to remove the now unused Corrective Space Telescope Axial Replacement (COSTAR), this as you will recall was the set of mirrors that corrected Hubble’s visions after the near disastrous problem with Hubble’s primary mirror. The task was to remove this and replace it with the brand new Cosmic Origin Spectrograph (COS). The COS is designed to study the large scale structure in the universe and how galaxies, stars, and planets evolved into what we see today. The next task would be to try to repair the Advance Camera For Surveys, (ACS). The ACS had been a problem for some time, it was installed in Hubble on servicing Mission 3B in 2002 but an electronics failure in 2007 rendered useless the most useful two science channels, now just operating on one remaining channel a repair attempt on this EVA would try to reinstate the Wide Field Channel. It was this channel that was responsible for 70% of the pre 2007 ACS Science and importantly it is hoped that once repaired it could answer some of the questions relating to the mysterious origins of Dark Matter and Dark Energy. With the ACS Wide Field Camera 3 (WFC-3) combined they would form a formidable team of instruments in the pursuit of those answers. The problem however for the ACS was that it never had been designed to be repaired in space! 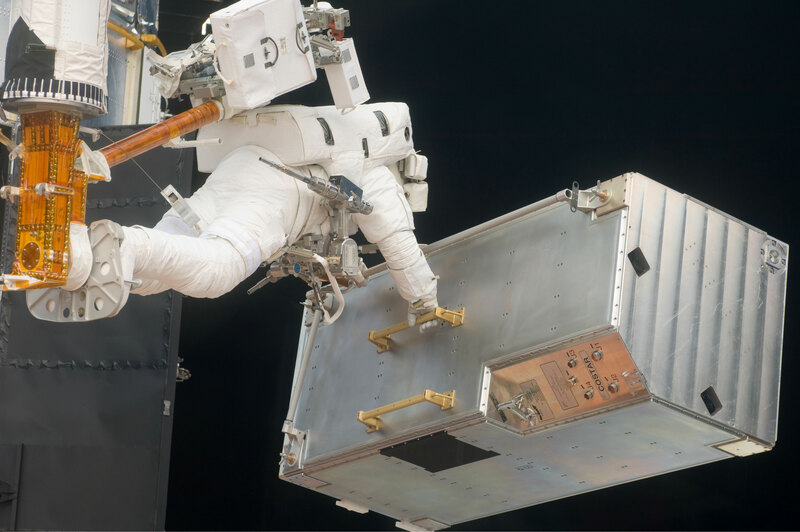 Using the specially designed tools from ATK, the spacewalkers carefully removed panels in the unit for access and slowly and methodically replaced the camera’s electronic circuit boards and power supply. After a ground check the ACS seemed to working OK and the repair deemed a success even though one channel wasn’t operating optimally. It was amazing that ground controllers envisaged EVA 3 to be the trickiest of them all with foreseen issues but it turned out to be the smoothest EVA of the mission so far. Well done Grunsfeld and Feustel. 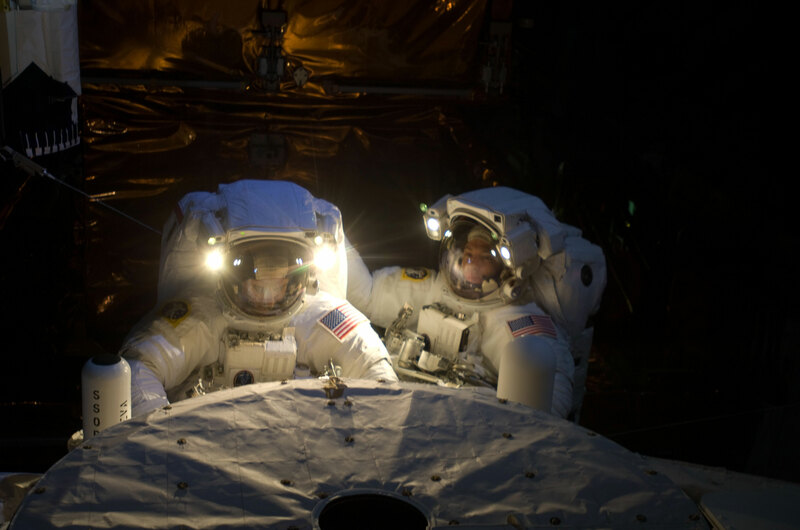 Alternating the EVA crew again on day 7 saw the return of Mike Massimino and Michael Good. Number one task today was the ambitious repair of the Space Telescope Imaging Spectrograph (STIS). This instrument was installed in Hubble during servicing mission 2 in 1997. Unfortunately, the instrument stopped functioning in August of 2004 due to a power supply failure and had been in “Safe Mode” since that time. A highly versatile instrument STIS mainly used for spectroscopy the splitting of light into it’s component wavelengths in order to give us a better understanding about Chemical and temperature of Comets, stars, interstellar gas and galaxies so it was high up on the list of things to get working again. However, the repair was not going to be an easy one. Massimino would have to remove 111 screws in order to remove the plate that allows access to the power supply. Anyone who has done any DIY on earth will know how fiddly it can be removing screws and how easy it is to loose them, imagine trying this in orbit wearing bulky gloves; it gives an idea of how hard a task it was. The task was made all the more difficult because Massimino had encountered a problem with one of the Hubble handrails. It had a stripped a bolt and this prevented it from coming loose so they could fit the plate. It was decided that the only real way of removing the handrail would be for Massimino to use force and literally break it free. This wasn’t without risk either as it could not only damage the skin of the telescope it could release dangerous debris into the telescope and into space and it could have had such sharp edges that if it wasn’t handled safely it may well have cut into Massimino’s space suit. Fortunately he managed to break and remove it safely some three hours into the EVA. As it turned out, the fastener-capture plate that had been so cleverly designed on the ground proved to be of great use and the screws were removed ok now access had been gained. Another issue then occurred when power to one of Massimino’s tools failed and a spare had to be retrieved. Whilst doing this Massimino took time to re charge his suits Oxygen supply. This issue had taken up valuable EVA time and by now the two space walkers were behind schedule so ground controllers decided that the task of replacing old thermal blankets with the New Outer Blanket Layers (NOBL) onto Bay 8 should be postponed and moved into another EVA period. It was by now Day 8 of Atlantis’s scheduled 11-day mission and the EVA 5 was slated to be the last. It fell to Grunsfeld and Feustel so finish up any last chores. Firstly they swapped out the battery module from Bay 3 and then replaced it with a second battery. They also did the task of replacing the Fine Guidance Sensor 3 on the telescope. Hubble has three of these sensors which help it to point itself. Two of the sensors are used to point the telescope and then lock it onto any astronomical target and the third sensor is then used to take positional measurements known as astrometry. All three are essential for Hubble. Because Grunsfeld and Feustel had completed these tasks ahead of schedule they were able to replace three sets of the NOBLs including the ones that Massimino and Good had run out of time to replace on EVA 4. All that remained were the four months of checking out and calibrating the instruments before scientific observations could begin again. Hubble was alive again! Day 9 was slated to be the day that the crew of Atlantis would release Mr. Hubble’s telescope back into orbit and bid farewell. 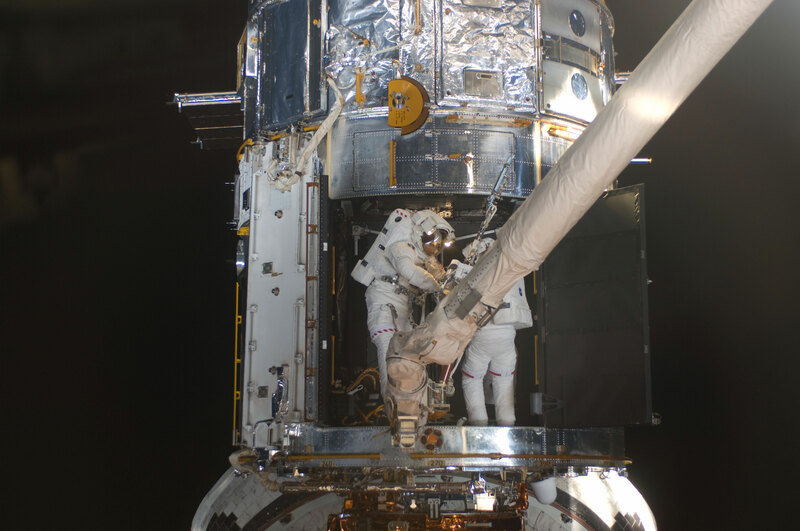 Megan McArthur captured Hubble once more with the robotic arm and slowly, carefully, methodically began the process of extracting Hubble from the payload bay and back into Earth’s orbit. Ground teams worked through several check lists and finally the command came for Megan to release Hubble back into space. Pilot Gregory Johnson performed a small engine burn and slowly Atlantis moved away from the telescope. STS-125’s mission to Hubble was finished. This article appeared in the April 2015 issue of RocketSTEM. Andy has been actively involved in astronomy and space for over 37 years becoming interested in astronomy aged 7. He has since travelled the world to promote astronomy give presentations and lectures, visiting and taking groups to observatories as far afield as those in the USA including Hawaii, mainland USA, Australia, and Chile. He has visited several space agencies and their facilities including those at NASA and ESA. And When the Space Shuttle was flying he reported on 2 Shuttle Missions for the BBC & Spaceflight Magazine. He is a STEM Science Ambassador as well as lecturer and consultant.